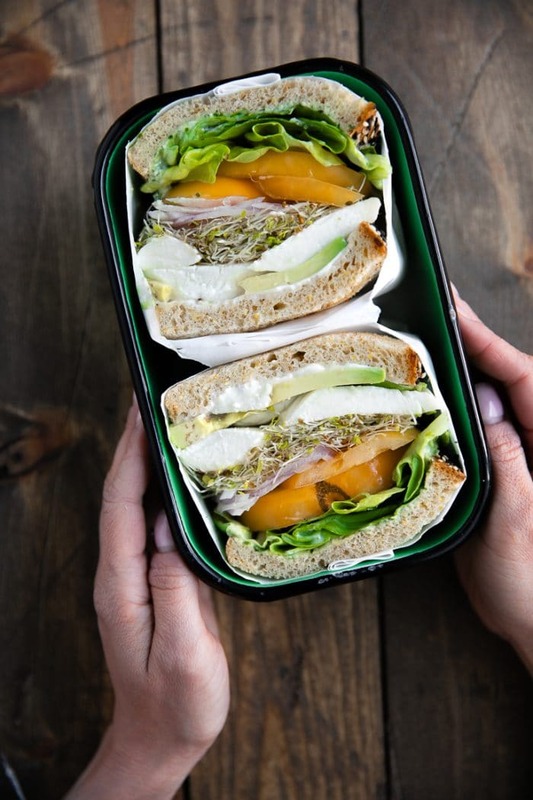 Fast and easy, this TOMATO MOZZARELLA SANDWICH WITH HERB MAYO is piled high with juicy tomatoes, creamy avocado, fresh whole milk mozzarella, sprouts, and homemade herb mayonnaise. Big sandwiches, like this Smashed Avocado and Chickpea Sandwich, Herbed Goat Cheese and Avocado Sandwich, and Sun-Dried Tomato Pesto Chicken Salad Sandwich, are my favorite and much easier to make than one may expect. 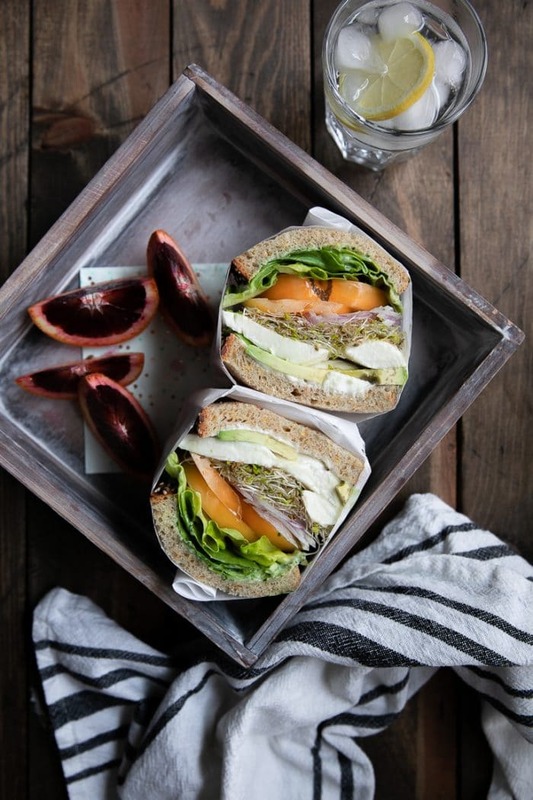 This Tomato Mozzarella Sandwich with Herb Mayo is no exception. Of course, this all depends on how you take yours. Some like a sandwich that is fat and stacked while others prefer something simple and skinny. And then there’s the subject of hot versus cold, open-faced verses closed, meaty versus vegetarian. And while I wish this post was all about how to make the perfect sandwich one hundred and one different kinds of ways, it’s not. To compromise, I’m showing you just this one tomato mozzarella sandwich with herb mayo. surprise! Since I couldn’t show you one hundred and one different sandwiches, I promise that I am showing you one totally kick-booty sandwich to make up for it. I mean, do you see that thing? I’m ready to go eat a second one. But first, let’s state the obvious about the one you see below. 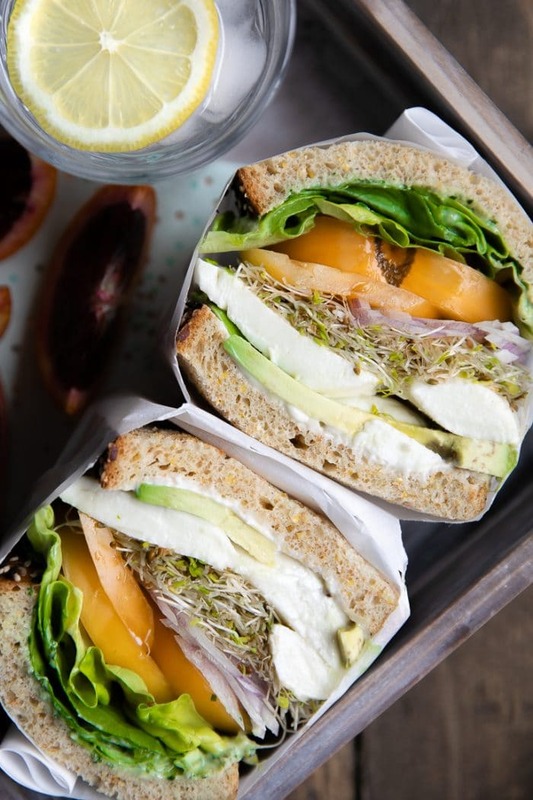 This sandwich is vegetarian (but not vegan- that mozzarella is on point). If I were to psychoanalyze myself I wonder what this sandwich would say about me…don’t worry, I’ll save that for another day. The mozzarella. I mean, do you see it? Do not go skinny on the mozzarella, you guys. It’s important. Tomato. 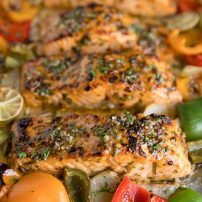 I had an orange heirloom leftover from a previous recipe that I decided to use, but you DO NOT have to go out and buy an orange heirloom tomato. Just make sure you get one that is firm, yet ripe and approximately the size of your bread (either in one slice or in two side-by-side). 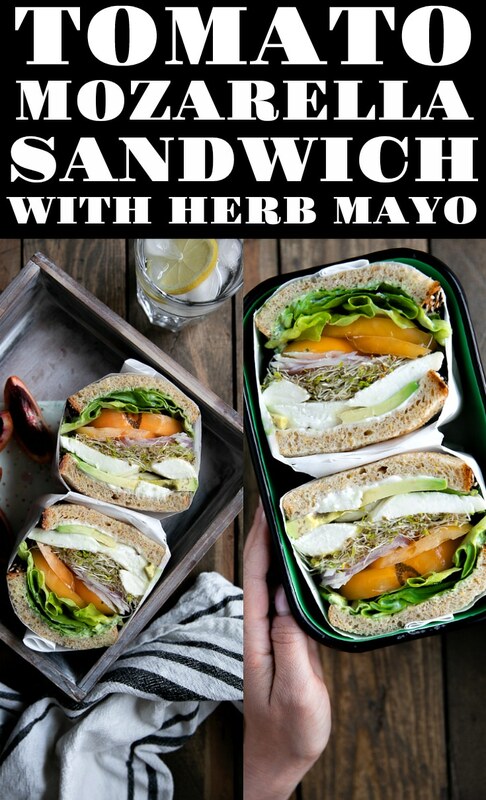 The herb mayo. So creamy and subtle and exactly what that mozzarella and tomato are begging to be smeared in. Avocado. Ok, this one may not be a key ingredient, but I love me some avocado any chance I can get. Besides, a veggie sandwich without avocado just seems wrong. Red onion. With so much awesome creaminess, this tomato and mozzarella sandwich needed a little spicy kick. I could talk about this for dayyysss. But I won’t. So this is what I’ve got. Use good bread and toast it just slightly. I’m actually going to yell that (sorry, not sorry)- ONLY SLIGHTLY TOAST THE BREAD. What do I mean by that? It should only be toasted around 30 seconds. You don’t want to actually toast the bread or dry it out. Think more along the lines of, I’m warming up my bread. I wish I had a good reason for doing this, but I don’t. It just seems to help. If this makes you nervous, totally ignore the yelling. The creamy base (mayo, mustard, mashed avocado) goes on first. On both bread slices. No, not both sides. One side. Both slices. Cheese goes on the bottom. Sliced cheese, or, in this case, FAT sliced mozzarella cheese. Spread that cheese out to the edges and corners. Make two fat slices and place side-by-side, however, you need to do it. (Meat)- if you were to add meat (like thinly sliced chicken breast meat), that would go here. Sliced veggies. Now, whatever you do, be consistent. So, don’t add one thinly sliced tomato on one end, and a fat end piece on the other. Just don’t do it. When in doubt secure with parchment paper or a toothpick. You guys, I’m not a sandwich master, but I’ve learned a few things over the years and this general order typically works. Dig deep into your preschool years of using building blocks to build the biggest tower ever! That’s basically sandwich making. Except you can eat it. So much talk about the actual tomato and mozzarella sandwich I almost forgot to tell you all about the herb-filled mayonnaise. Well, you guys, it’s pretty self-explanatory. Except for one ingredient that deserves a sentence or two. You’ll see why. Obviously, they are completely optional. If you are vegetarian, leave them out. If you are not, however, I can almost guarantee that you won’t taste them. At least, it won’t taste like you’ve added a fish to your sandwich. But, these little tiny ocean swimmers do add good flavor. If you’re not into it, don’t worry. My feelings won’t be hurt and the herb mayo will still be creamy, delicious and herby. I just thought I would throw it out there. Think about the flavor combinations. For me, this usually applies to the mayo and mustard. What part of the sandwich tastes best paired with the mayo? What part of the sandwich tastes best with mustard? And can you get those flavors to align in the sandwich? I love cheese and mayo, so the mayo always goes on the bottom slice of bread. On the other hand, mustard and greens go well (remember, personal preference), so mustard goes on the top slice. Add texture. In other words, this sandwich would have failed if I hadn’t added the sprouts and lettuce and thinly sliced red onion. A sandwich can’t survive if everything is goopy and mushy. Add a buffer layer. Sometimes no matter how hard we try things still fall apart (whoa, you guys, sandwiches and life are basically the same things). Anyway, when times get tough, or in the case of this sandwich, unbalanced, get some help…from sprouts. Those sprouts in the middle are my buffer layer. Be proportional and consistent. Now, to be honest, this sandwich isn’t the best example considering the massive mozzarella and tomato slices. But, I made it work. Somehow. As a general rule, however, make sure your tomato, meat, cheese, and vegetable slices are consistent with each other. If you really love cheese, you can always add two slices. Avocado. Avocado is always annoying. It will slip and slide all over the place. So, unless you plan to take a picture of your sandwich, I recommend mashing that avocado…and then just expect it to squeeze out the side. But, if you’re like me and really love avocado, you’ll make it work. You have to. 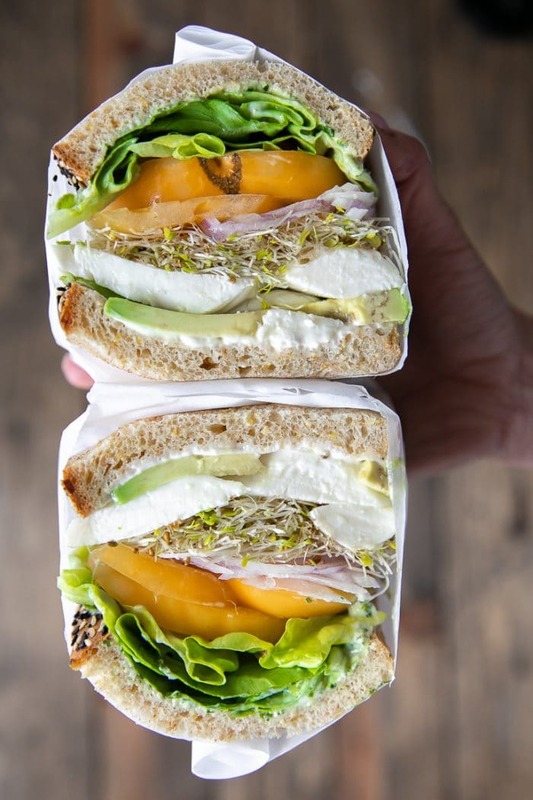 Made with fresh whole milk mozzarella, homemade herb mayonnaise, creamy avocado, and spicy red onion, this Tomato Mozzarella Sandwich with Herb Mayo is a fast and fresh alternative to an otherwise boring sandwich. Prepare the mayo ahead of time and keep it in the refrigerator up to a week! In the bowl of a small food processor, add all ingredients for the herb mayonnaise. Blend until smooth. Set aside in the refrigerator until ready to serve. Lightly toast the bread and spread each slice with one tablespoon of mayonnaise. Top one slice of bread with the avocado, sliced mozzarella, sliced red onion, alfalfa, and butter lettuce. Place the other slice of toasted bread on top. Wrap the sandwich in a piece of parchment paper and slice in half with a sharp knife. 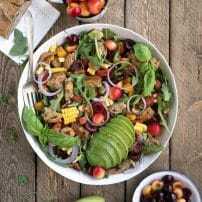 So light and healthy – this was such a good lunch! Thank you so much! I am so happy you enjoyed the recipe!